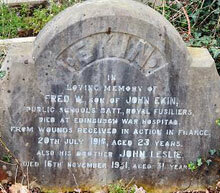 Frederick William Ekin was the eldest son of John and Annie Ekin. Frederick was born on 20th July 1893 in the Shankill area of Belfast. Frederick lived in Belfast. John Ekin was a grocery agent. 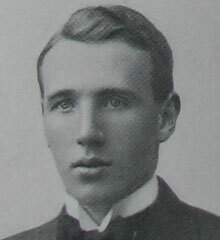 Frederick was educated at the Royal Belfast Academical Institution and attended Queens University for one year, 1914-1915, and was a Member of Training Corps. On enlistment he served with the Royal Fusiliers (Old Public Schools Battalion) and was seriously wounded, having received a gunshot to his arm at the Battle of the Somme on 20th July 1916. He died in Edinburgh War Hospital, Bangor, Scotland and was buried in Belfast City Cemetery. As far as can be ascertained, Fredrick Ekin never lived in Coagh. The cemetery has commemorations from both world wars and a Cross of Sacrifice is erected within the site. There are now 296 Commonwealth burials of the 1914-1918 war and 274 of the 1939-1945 war commemorated here. Of the 1939-1945 burials 5 are unidentified. There are also 3 Norwegian Foreign Nationals and 7 non world war burials here. Those of the 1914-1918 war whose graves are not marked by headstones are named on a Screen Wall memorial in Plot H.